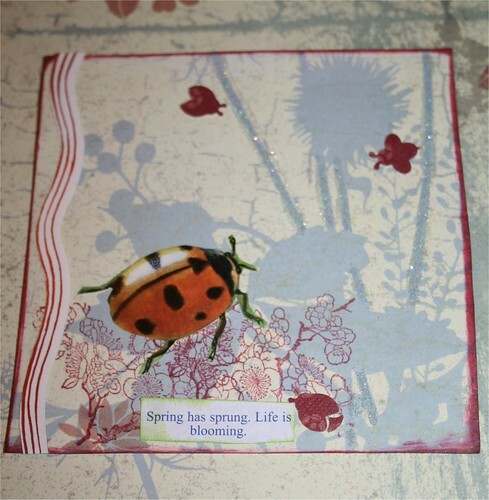 Life is blooming Collage Card, originally uploaded by DianthusMoon. I really look forward to ‘life blooming’ this time of year. From looking out the window at bleak and brown in the winter to green and growing in the spring just makes me happier! We haven’t had the sunniest of weeks this week. I did very little gardening, but also got to do a few tasks around the house. I think on Sunday I’ll dig around the basement for a few ‘fairy garden’ props. Really tiny props for really tiny gardens…you’ll see. So I got a bug punch and wanted to use some, hence this card. I also was making a bug related card to swap with a friend-it’s all hand drawn and I’ll share when she says she got it-it’s nice to get a surprise, don’t you think. I’ll be taking my camera to the wedding tomorrow-it should be beautiful! BTW-my allergies seem better, but still achy, but more isolated, so maybe the old medicine was causing more issues. I hope you have a great time at the wedding!